Suffolk Cemetery, La Rolanderie Farm, can be found in the middle of the fields a few hundred yards south of the town of Erquinghem-Lys. …I wouldn’t advise taking your car up the track all the way to the cemetery even on a decent day; park at the farm buildings and walk the rest of the way. Serious fighting took place in these fields in April 1918 – we are still in the area known as the ‘Nursery’ (see the ‘categories’ section), but the reason this cemetery exists bears no relation whatsoever to the term, and has everything to do with the extreme violence that broke out here over a few days that spring – and the walk to and from the cemetery gives you a few minutes to contemplate the fact. The farm buildings at La Rolanderie had suffered considerable damage from German artillery in the spring of 1918. 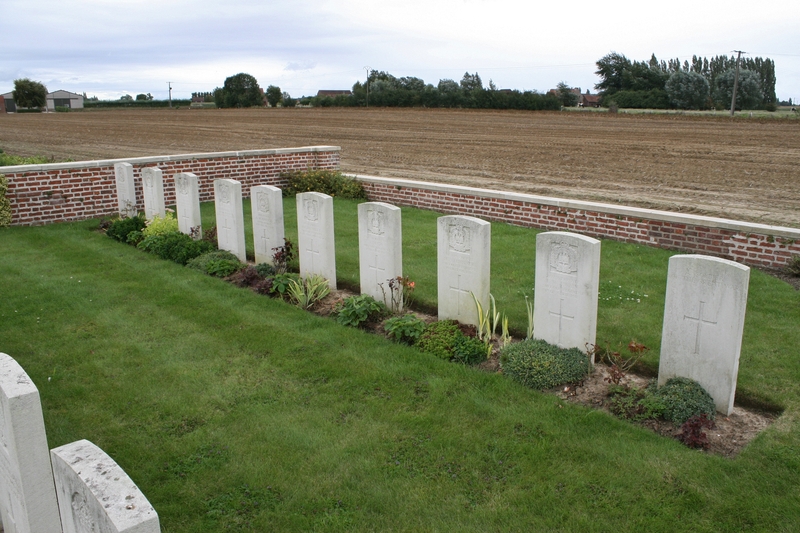 On the face of it, and according to the CWGC Casualty List, a single Machine Gun Corps private was the first to be buried here in the fields to the south of the farm on 9th April, joined by one of his colleagues and six men of the 11th Bn. Suffolk Regiment the following day, and a further five more men over the next week, but the majority of men buried here were Suffolk men killed on 19th April. Or at least that is what the dates on the online Casualty List, and on the headstones, tell us. We shall see (and before we go on, I ought to mention that you will find somewhat more detail at certain points in this post than usual, and by the time we get to the end, it will, I hope, be clear why). At the beginning of April 1918 the 11th Bn. 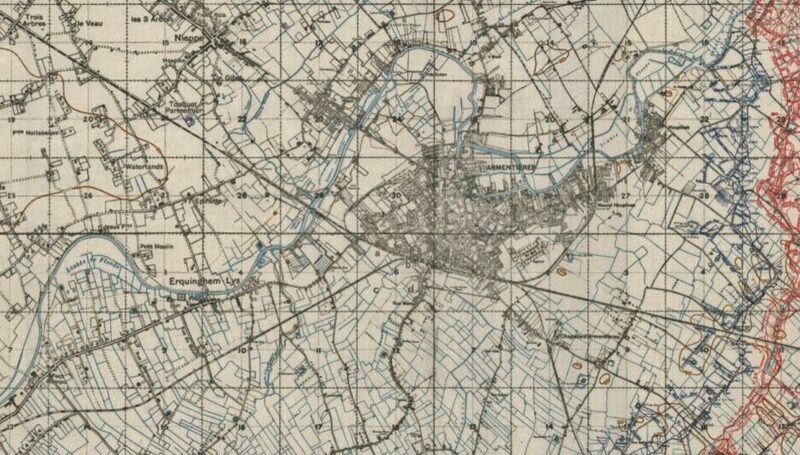 Suffolk Regiment had been holding the line a few miles east of here at Nouvel Houplines, on the eastern outskirts of Armentières (see map below). Although a relatively quiet sector, conditions in the spring of 1918 were so poor that flood water had made the British front line untenable, the troops holding the support trenches instead; patrols were unable to find any trace of enemy movement, their front line trenches appearing to be derelict as well. 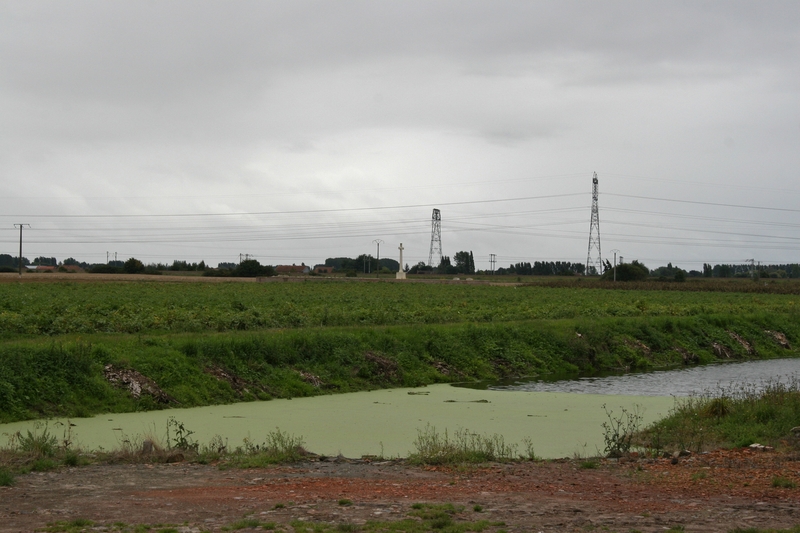 It’s worth remembering that the word trenches in this area was somewhat of a misnomer, and involved not a lot of digging, as a result of the high water table, but an awful lot of above-ground construction, with the obvious dangers involved. This map from September 1917 (nothing much had changed by the spring of 1918) shows Erquinghem-Lys, just a small village at the time, to the immediate south of the River Lys as it meanders its way towards the town of Armentières. The front lines (German trenches in red) can be seen on the far right of the map, their north-south orientation beginning to change to a north-east to south west direction at the bottom of the map. It’s worth noting (for later) the railway line, crossing the map just south of Armentières, and leading to Bailleul, several miles away past Trois Arbres in the top left corner of the map. 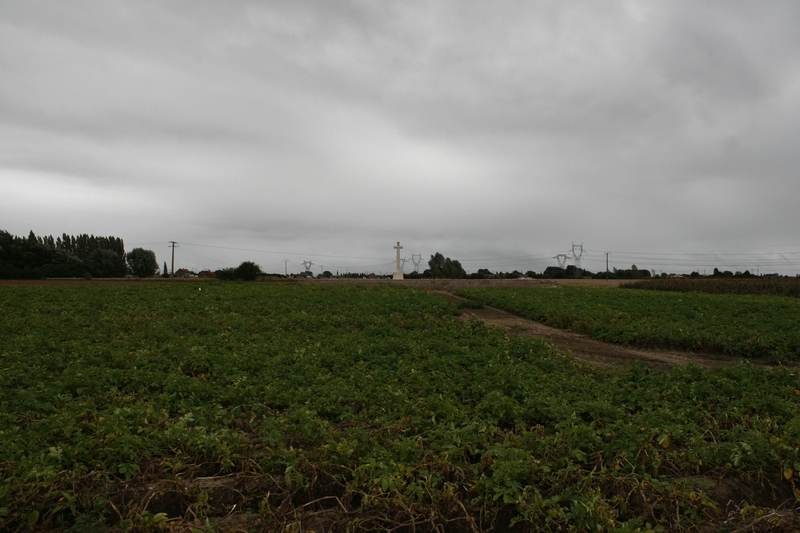 On 5th April the Suffolks were ordered to proceed the few miles to La Rolanderie, just south of Erquinghem; interestingly, and most prudently, as they were familiar with the terrain and it would have made no sense to move them elsewhere, personnel attached to the Royal Engineers and tunnelling company were left where they were. Following the move the battalion spent the following day resting and refitting. 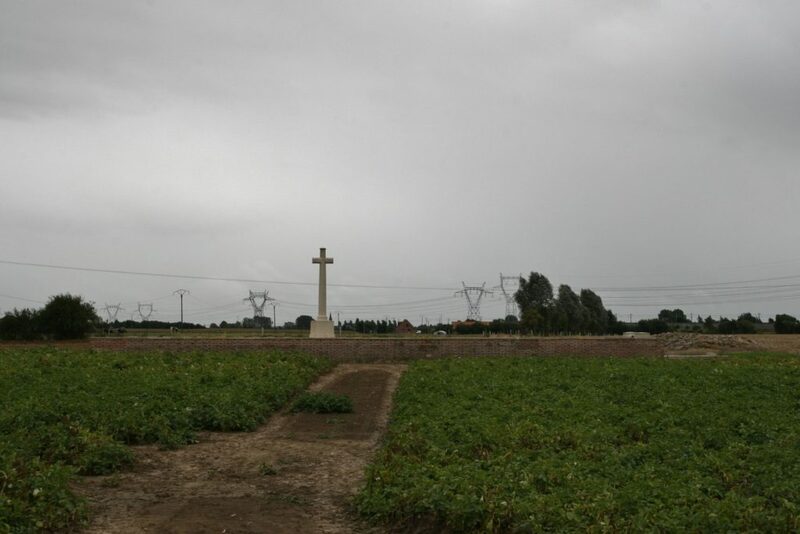 On 7th April 1918 the Germans launched their Georgette Offensive (or, as it became known to the Allies, the Battle of the Lys), the second of four, smaller, offensives to follow the much larger Operation Michael, which had opened on 21st March on the Somme and had ended on 5th April, after a forty mile German advance, outside the city of Amiens. Georgette’s objective was to capture of the City of Ypres (Ieper) and drive the British Army in Belgium and northern France back to the channel ports and, effectively, out of the war. The German bombardment began on 7th April, and on 9th April the German infantry attacked along a fifteen mile front between Armentières to the north and Festubert to the south, pushing the Portuguese and British troops along a five mile front in the south of the attacked sector back more than nine miles over the next two days, until British reserves halted the advance at Estaires. 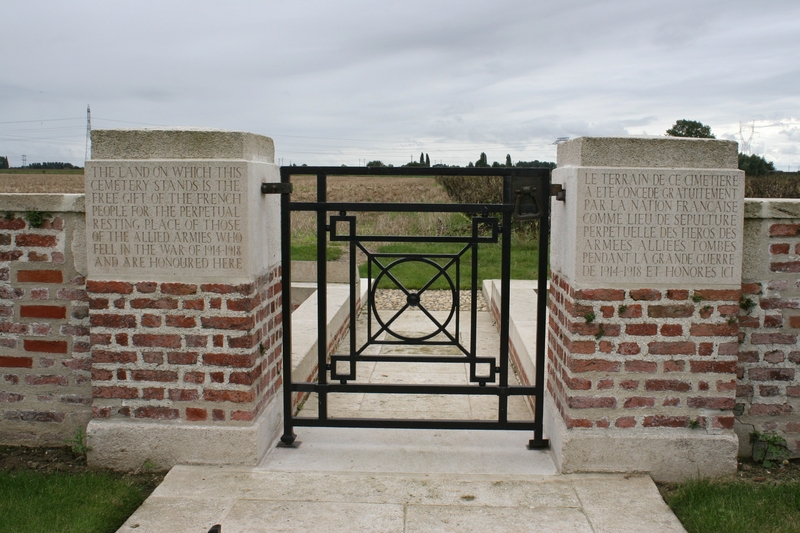 To compound the British problems, on 10th April the Germans launched another offensive (the third Battle of Messines) to the north of the River Lys, where they succeeded in capturing the village of Messines itself, advancing nearly two miles and prompting Haig to issue his famous ‘backs to the wall’ order. 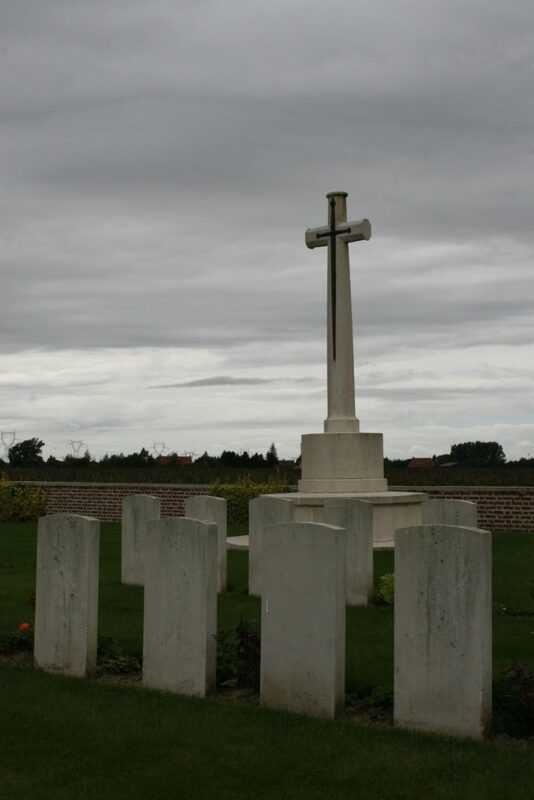 But to the north of the first attack south of the river, at Armentières and Erquinghem, the Germans were having a far harder time of it and their advance was proving far more problematic, and it is the action that took place here, and its relation to this little cemetery, that the narrative that follows a little later will explore. The cemetery consists of four rows of headstones, split into two plots, with a further three headstones (hidden by the Cross) at the far, north eastern end. 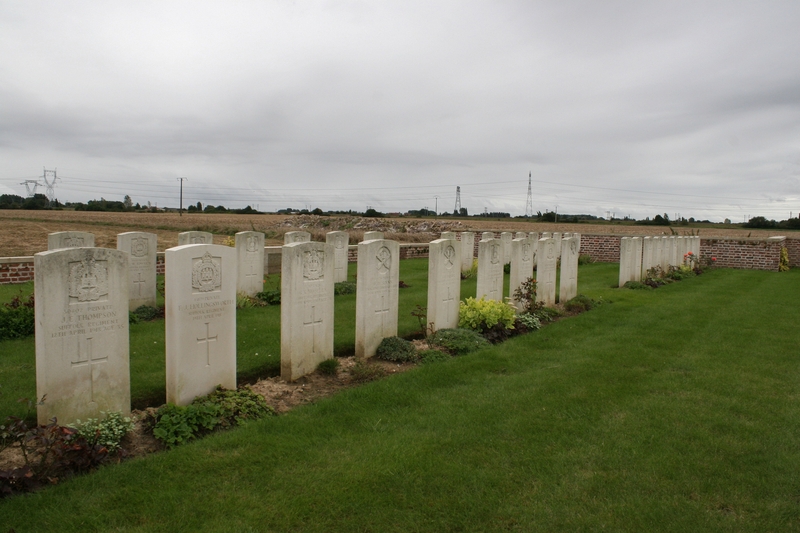 Twenty eight of the thirty five identified graves here are men of the 11th Bn. Suffolk Regiment. 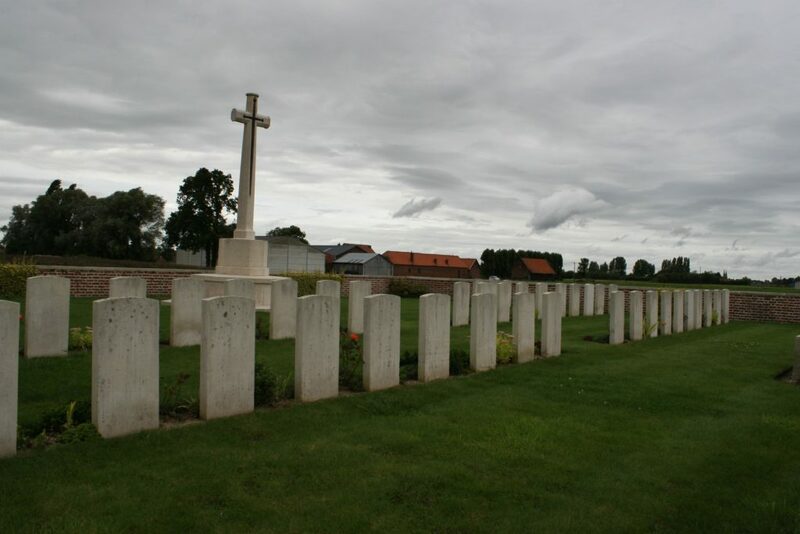 Here’s the Cemetery Plan, courtesy, as ever, of our friends at the CWGC. Seven of the eight unidentified men buried here are to be found in Plot II Row B (foreground) immediately on entering the cemetery, and five of these are known to be Suffolk men. 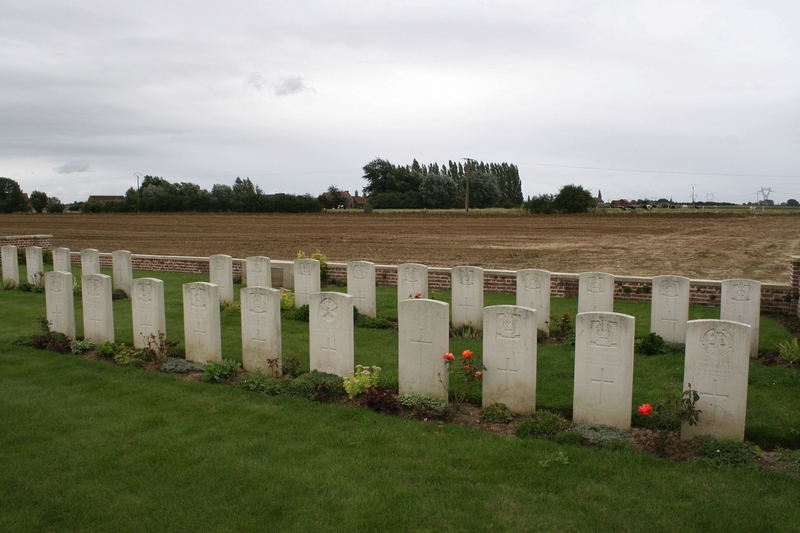 On the far right is the grave of Private T. Huddleston, East Lancashire Regiment, one of only four non-Suffolk men among the identified burials here. Plot II Row B (foreground), with Row A behind. 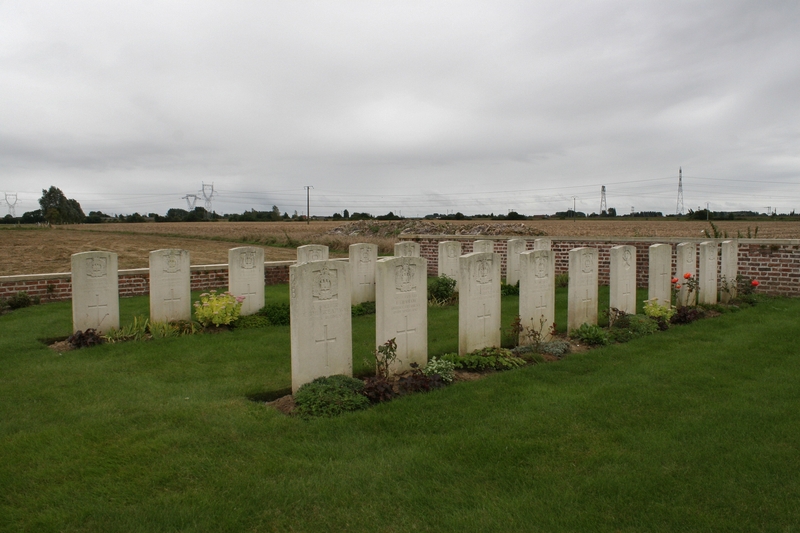 …and three more unknown soldiers in the centre of the same row, on the left another Suffolk man, in the centre a Machine Gunner, and on the right, one of only two totally unidentified soldiers buried in this cemetery. 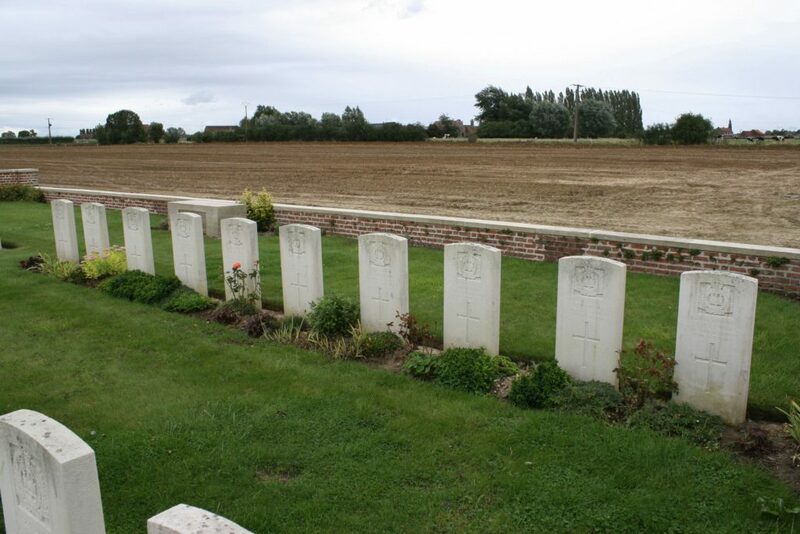 Plot II Row A, all 11th Bn. Suffolk men. 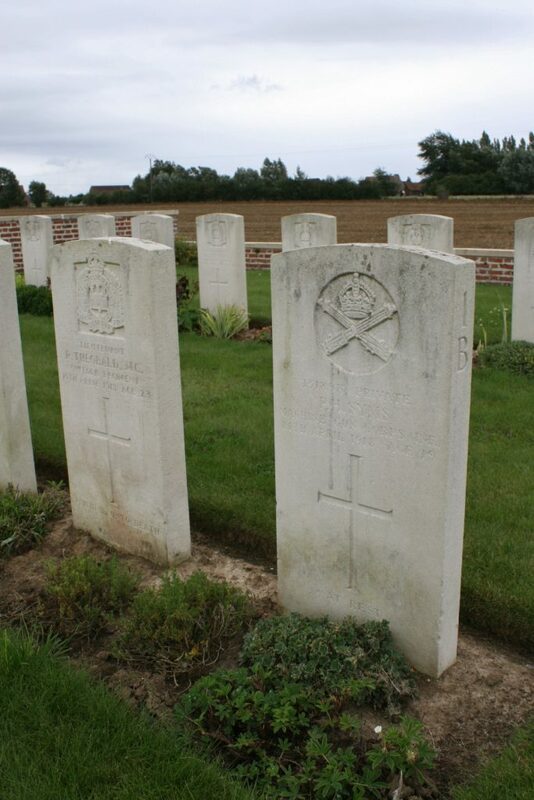 …Private Percival Harold Syms, just nineteen when he died, buried next to twenty three year old 11th Suffolks officer, Lieutenant Reginald Theobald M.C.. Along with Private Huddleston, whom we met earlier, the three machine gunners are the only non-Suffolk burials among the identified men in the cemetery. Plot I Row A, with the second totally unidentified soldier on the far right. Back to the day of 7th April 1918, which passed peacefully for the 11th Suffolks, the battalion even finding time for a church parade. That night, however, the Germans commenced an intense gas shell bombardment of the area in the neighbourhood of Armentières, from Houplines through Nieppe to Laundries, south of the Armentières-Bailleul railway. The bombardment lasted the whole night as German artillery projected thousands of gas and high explosive shells into the British front and support lines and the rear area beyond (the majority of gas casualties were among the British artillerymen), but no infantry attack followed, and the following day passed relatively quietly. 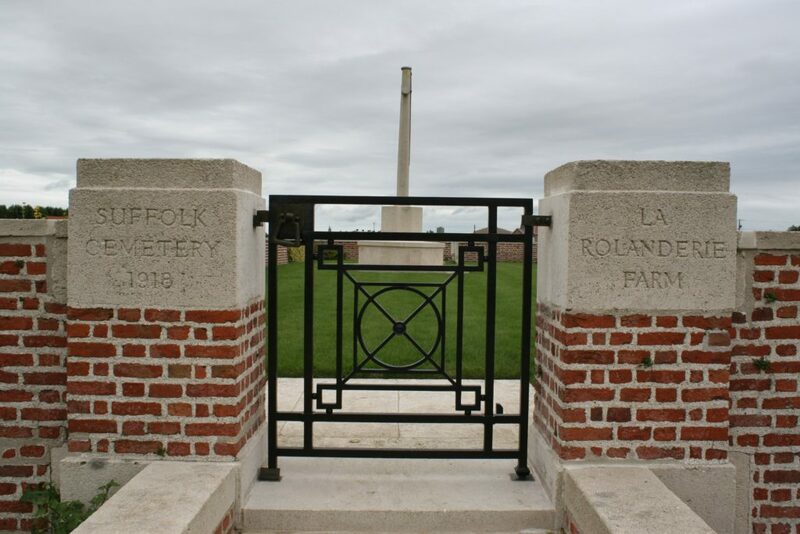 During the night of the 8th April the majority of the Suffolks were in Divisional reserve at Erquinghem, (along with the 16th Bn. Royal Scots), with three companies at La Rolanderie Farm. 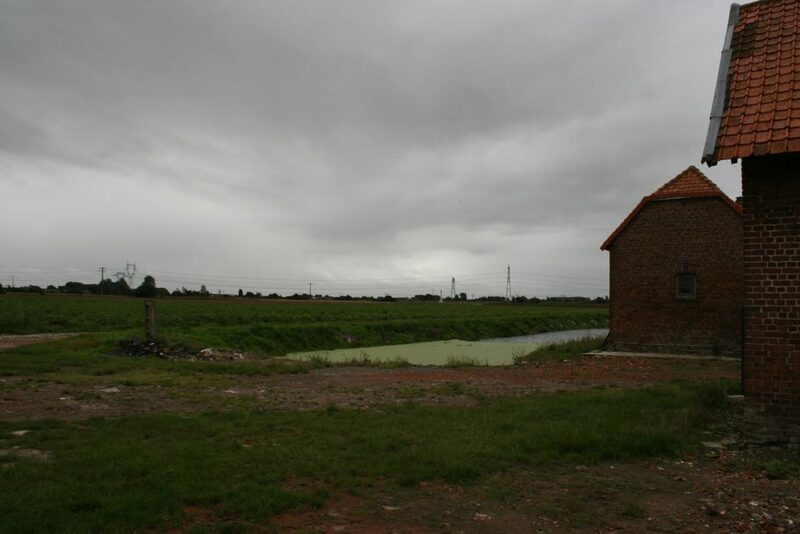 The Scots had arrived that night, two companies being disposed on the western edge of the village near Rue Dormoire, and two in the village near the church. At 4.00 am on the morning of 9th April, the Germans once more unleashed an intense artillery barrage on the British lines and support areas, Erquinghem itself being so heavily shelled that both the Suffolks and the Scots in the town were dispersed into trenches in the adjoining fields to avoid the shellfire. Small arms fire could also occasionally be heard, and it seemed as if a German attack was imminent, if not already under way. As the barrage continued Canadian Royal Engineers were ordered to erect emergency bridges across the River Lys should the men be forced to withdraw north of the river, and Germans were soon reported to be advancing in large numbers all along the front. In the early evening Royal Scots’ fighting patrols were sent forward and found Fleurbaix strongly held by Germans, small encounters taking place on the outskirts of the village, and it was now clear that this was indeed a major German offensive. The three headstones of Plot I Row C (above & below). Private Herbert Maynard (far right) is one of just three men of the 12th Bn. 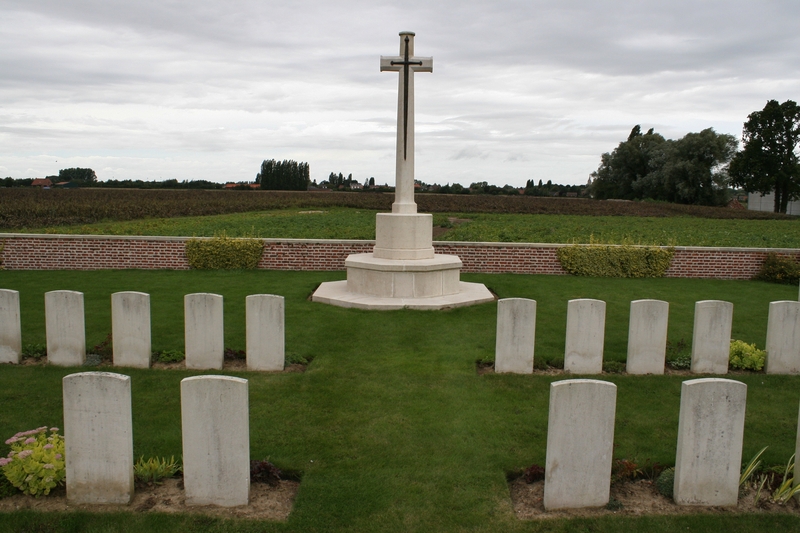 Suffolk Regiment buried here, all of whose date of death is given as 12th April. They are the only casualties from that date to be found in the cemetery. 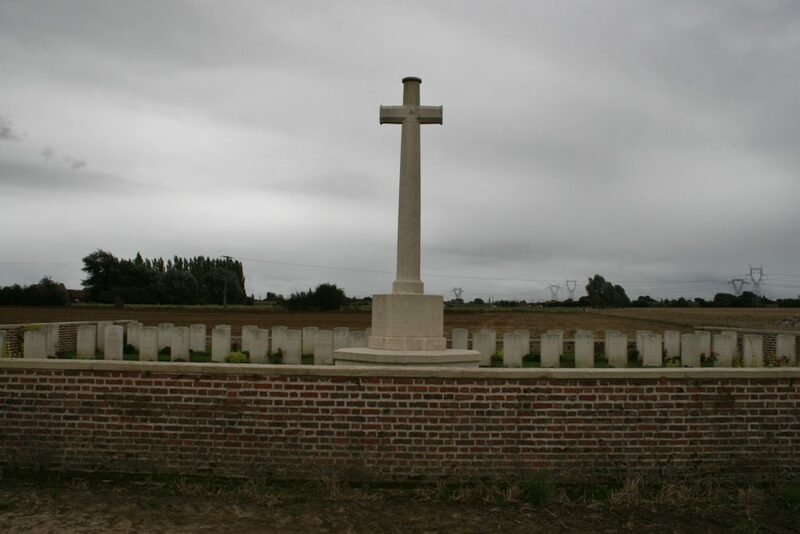 By 7.00 am on the morning of 10th April, German attacks had penetrated the British line, cutting off those of the Royal Scots in the neighbourhood of Rue Dormoire, who fought on doggedly despite being entirely surrounded. The situation was critical, as a gap now existed between the right of 11th Suffolks, holding fast, and the left of the Royal Scots, which was swinging back, exposing the right flank of the Suffolks, who risked being surrounded themselves before reserves could arrive. The reserve company at La Rolanderie Farm was immediately dispatched to counterattack the enemy and fill the gap between the Suffolks and the Royal Scots. The Germans seemed not to have realised, or at least failed to exploit, the temporary gap at the west end of Erquinghem, as only a few of their troops were pushed through before British reserves arrived, the Germans driven back, the gap plugged and the line re-established. 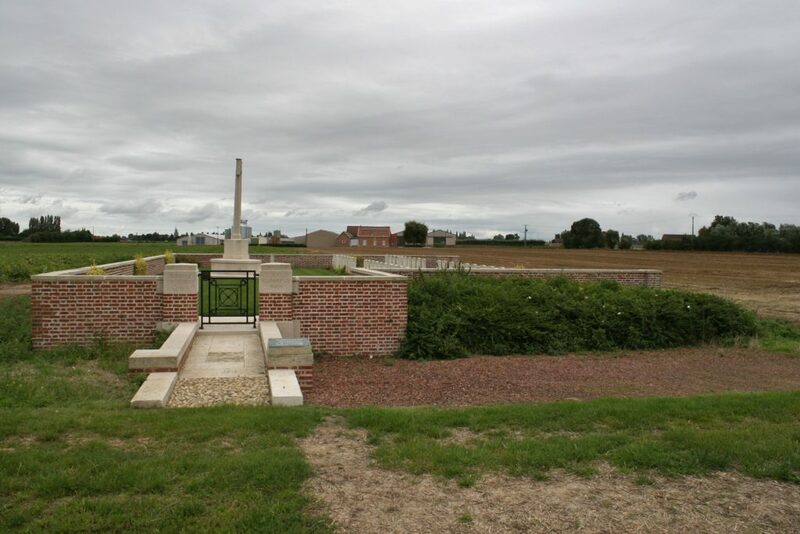 The 11th Suffolks, however, were now left with no reserves whatsoever, except the Battalion Headquarters personnel dug in just to the west of La Rolanderie Farm. During the morning the enemy pushed forward infantry, machine guns and field guns (the Battalion War Diary dryly notes, “probably our own”). Troops on the right began to give way slowly as the line was gradually pushed in around Erquinghem itself. At 2.00 pm the Germans attacked along nearly the whole of the 11th Suffolks’ front, forcing the men on the right of the battalion to continue their slow withdrawal, covered by outposts as they retired, whilst also obtaining a footing in the centre of the Suffolk line. The retreating men on the right made contact with a party of the Duke of Wellington’s Regiment, who had arrived just in time to prevent the Germans from entering Erquinghem itself, while the troops whose position had been penetrated by the Germans in the centre were rapidly reforming, along with the battalion Headquarters staff, on a line just west of La Rolanderie Farm, again with outposts in front of them to give warning of German attacks. By mid-afternoon the German onslaught had been checked and the line re-established from La Rolanderie Farm to the south east end of Erquinghem itself. Attacks continued, however, and the troops south of the river were ordered to withdraw to the northern bank, covered by the 11th Suffolks. 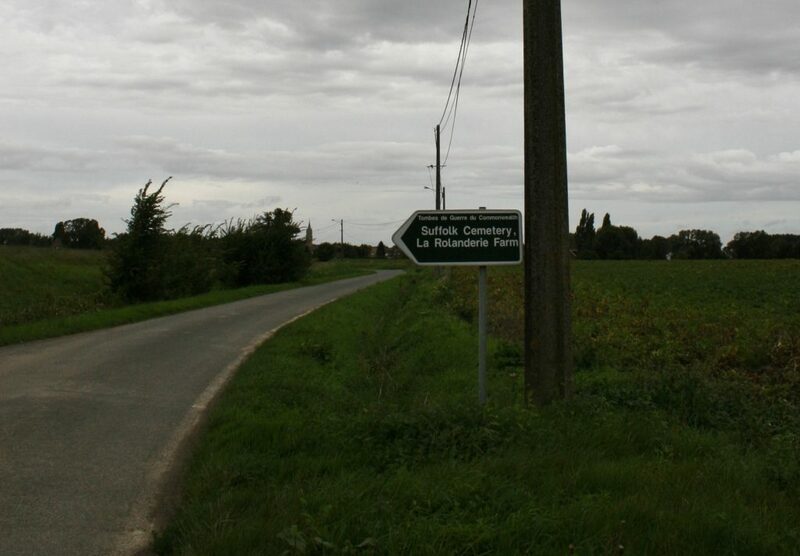 By about 5.00 pm, by which time the Suffolks’ left flank was heavily engaged on three sides, and German machine guns were sweeping the men in the battalion’s centre, the Suffolks themselves crossed the river, immediately setting up outposts on all flanks, according to the War Diary “facing in every direction”. In the chaos of the battle, as night fell, and with the battalion now being harassed once again by German machine guns, and the sound of firing even coming from the direction of Le Veau, away to the north west, patrols were sent out to get in touch with any British troops in the neighbourhood, which they did by finding the right flank of the 16th Royal Scots, and to establish the current positions of the enemy. 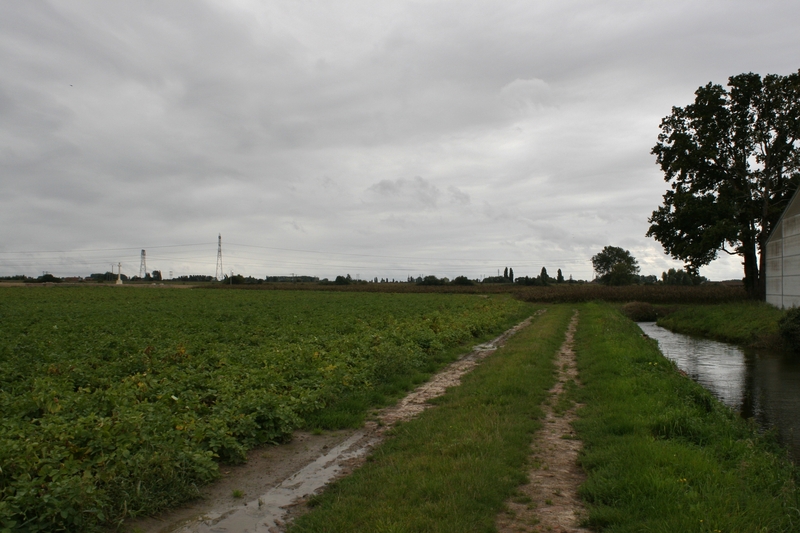 Very early in the morning of the 11th April the Suffolks were ordered to form the rearguard as the brigade withdrew to Nieppe (see trench map), the battalion taking up position along the Armentières – Bailleul railway facing south west, 103rd Brigade on the left, 16th Royal Scots on the right. Outposts and patrols were pushed forward, and in the afternoon 103rd Brigade was attacked, but not the Suffolks. The battalion then withdrew towards La Crèche, spending the night in a farm near Blanche Maison. In the photograph above the outskirts of Erquinghem-Lys can be seen in the background, as well as the church spire, just to the left of the trees in the centre, where we were last ‘Nursery’ post. The next few days were days of hold and retreat, “the enemy again pushed forward infantry machine guns and trench mortars and harassed battalion positions considerably. Enemy aeroplanes flying very low were firing continuously on our troops during the whole afternoon and seriously interfered with any movement”, of heavy German artillery bombardments, and constant attacks by considerably superior German forces. Twice on the 14th the Suffolks were “very heavily shelled by own artillery causing many casualties.” Patrols showed the Germans to be some 1000 yards away to the south west. The 15th was another critical day. The Officer Commanding 11th Suffolks reported; “Position in front is very serious. O.C. 2/6th North Staffs in person reports his battalion, and probably his Brigade, broken. I have patrols out in front. Stragglers coming through, freely, mostly without arms or equipment.” Exhausted men of 59th Division were making their way back to the British lines in large numbers, and the Suffolks once more found themselves in the front line. More heavy shelling continued throughout the 17th, the Germans on the receiving end too, as they advanced through Bailleul and dug in on the outskirts. Finally, for the Suffolks and the 16th Royal Scots, alongside them throughout the battle, the early hours of 18th April brought a halt to the fighting, as they were relieved by 17th & 19th Bns. King’s Liverpools, moving into reserve positions, before being further relieved by the 133rd French Division on the night of 20th/21st April, both battalions marching to bivouacs just east of Boeschepe, some ten miles away to the north west. The 11th Suffolks’ total casualties during the month of April 1918 would amount to 23 Officers & 471 Other Ranks killed, wounded or missing, those of the 16th Bn. Royal Scots 13 Officers & 554 Other Ranks. Operation Georgette would continue until 29th April, the Germans making further advances before the effect of French reinforcements, whom Marshall Foch had agreed to send to the Lys sector on 14th April, and the steadily rising casualty rate (we shall visit some of the German cemeteries in the area later this year), caused the German High Command to call off the offensive. Which leaves us with one tiny problem as far as the cemetery is concerned. Take a look at this map. 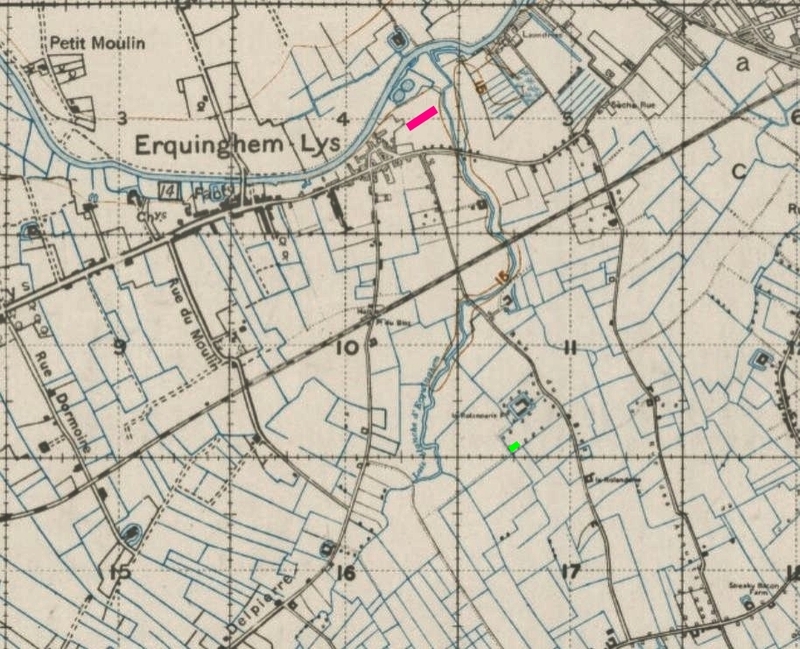 Both Erquinghem cemeteries are clearly marked, Erquinghem-Lys Churchyard Extension in pink, and Suffolk Cemetery, La Rolanderie in green in the fields to the south; Rue Dormoire, mentioned a couple of times in the text, is on the left of the map. As we have seen, the 11th Suffolks finally crossed to the northern bank of the river at about five in the afternoon of 1oth April, and by early morning of 11th April were holding positions to the north of the Armentières-Bailleul railway line (which I told you to note when you perused the previous map, and is not the railway line crossing the one above, which is the line to Merville and has nothing whatsoever to do with anything – you can, however, just see the one I am talking about to the very top right), a good mile north of both the river and Erquinghem-Lys, and from there, slowly but surely over the next few days, as we have seen, they were forced to withdraw further. Which leaves us with a cemetery full of men, the vast majority of whom are supposed to have died more than a week after their battalion had left the immediate area, and two days, give or take, after they had been relieved by the King’s Liverpools and moved into reserve positions. 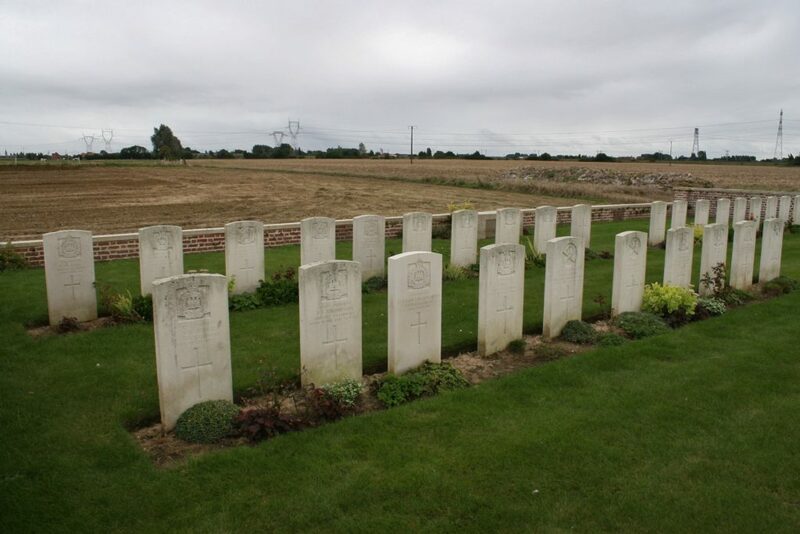 Twenty two headstones in this cemetery, all 11th Suffolks, give a date of death of 19th April, which cannot possibly be true. Some research required, methinks. And it didn’t take long. These are the two Graves Registration Reports for the cemetery, both shown here courtesy of the CWGC, and, as I looked, admittedly knowing roughly what I was hoping to find, it was still quite a moment when I realised that the solution to the problem was staring me in the face. It’s easier to point out how the mistake, or mistakes, arose using the second document. 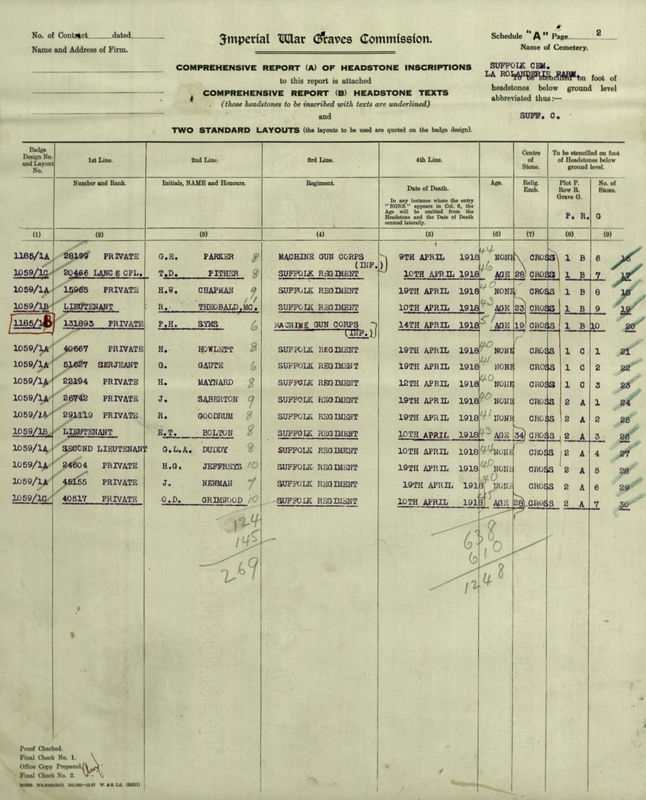 Look at the dates next to all but the first man in Plot 2 Row A (and therefore all the dittos too), and against Private Bunting, one from the bottom of the page, and Private Graham, in the centre. All appear to have a crossed out 9 replaced by a 19, hence the date on the headstones. But all is not as it appears, is it? What it actually says, I suggest, is 9/19, i.e. 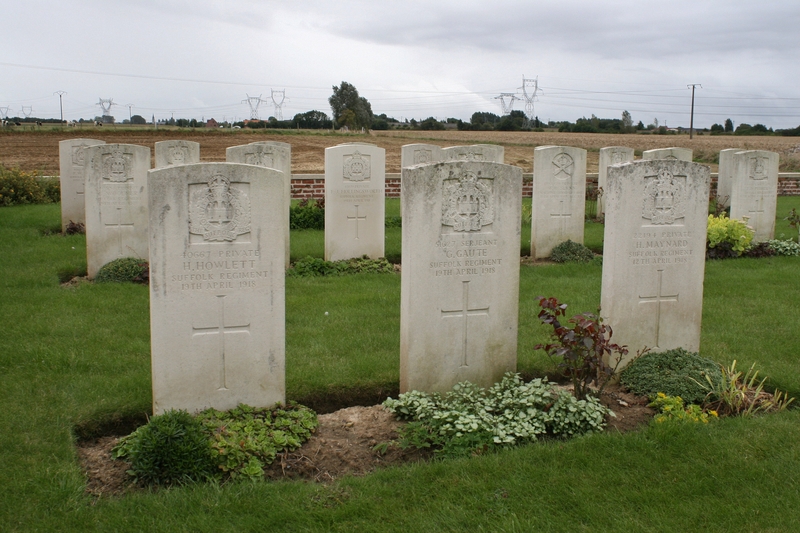 ‘these men died between 9th & 19th April, but we’re not sure of the exact date’. But I reckon that you and I do, certainly to within two days. As the battalion was north of the river by the early evening of 10th April, unless someone kept nipping back across the river into German territory to bury people for the next nine days (I don’t mean to sound facetious, but give me another explanation), we know that they must have died on either 9th or 10th April, and no later. 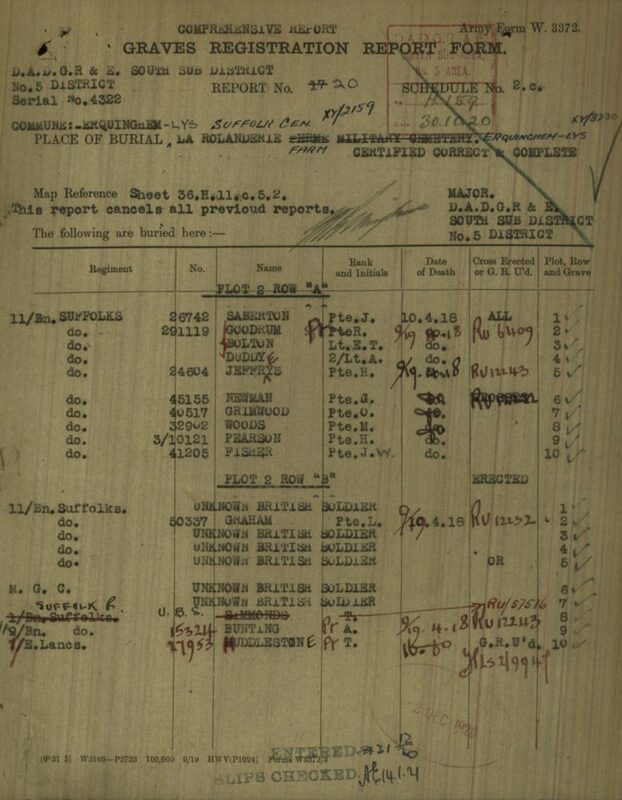 Similarly, next to two of the three 12th Bn, men on the first document it says 8/12, i.e. 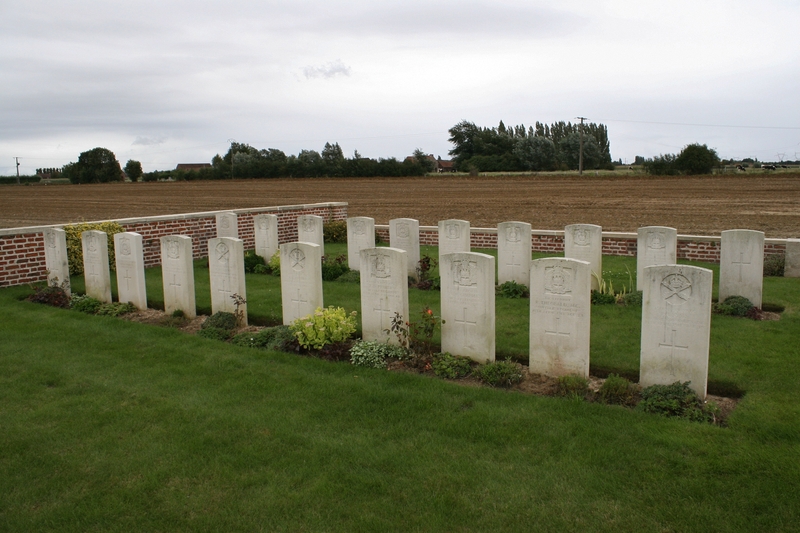 they died sometime between 8th & 12th April, and as we have seen, men of the 12th Suffolks were picked up 11th Bn. 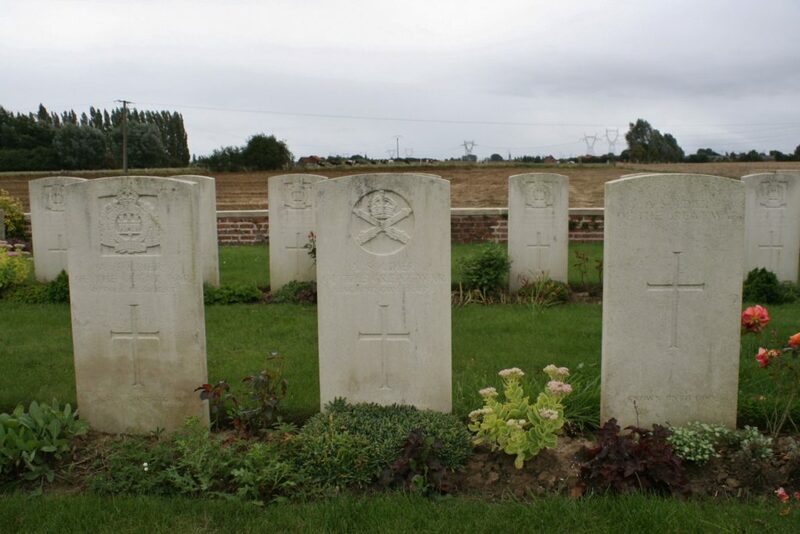 during the battle on 9th April, so once again these men must have died no later than 10th April, as they would have withdrawn across the river with the men of 11th Bn. Some of the names on the second Graves Registration Report re-appear on this undated, but certainly later, Headstone Inscription form, and, as you can see, the 9/19 has now been interpreted as a definitive date of death of 19th April. The mistake has now been made, and it’s never been corrected. 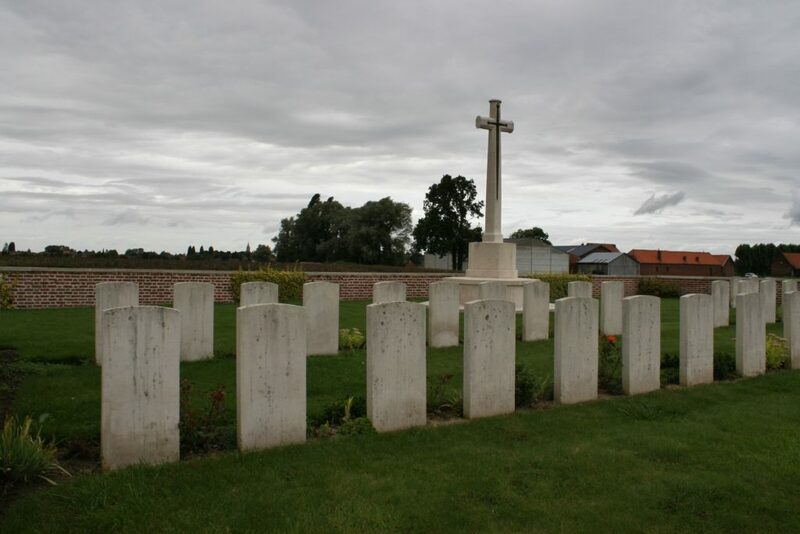 Because in fact, whatever the regiment, it is inconceivable that any of the burials were made here after 10th April, and for your information, and unlike other burial grounds in the region, this little cemetery was not re-opened when the Allies advanced later in the year. 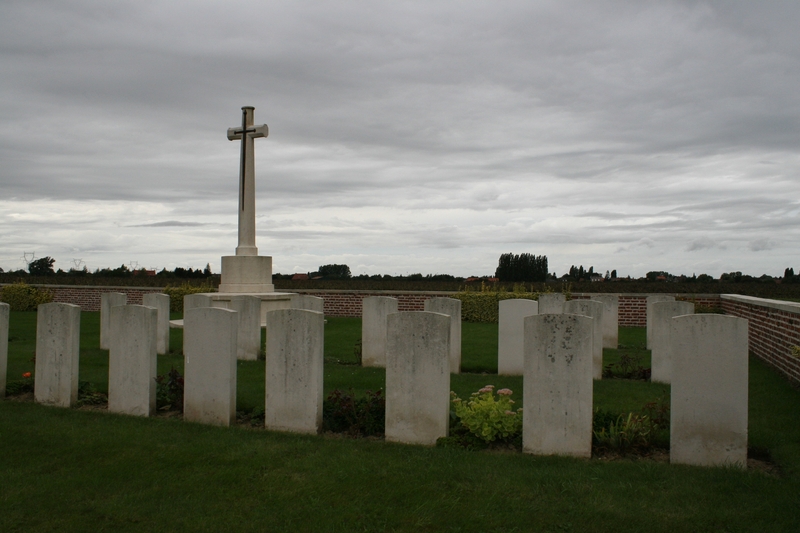 There were no further burials here, and although it is possible, before you ask, that some of these men might have been buried by the Germans, there isn’t much logic in the argument, and it doesn’t change the parameters of their dates of death. So, as we make our way back to the farm and the car, what to do next? Take some advice, I suppose, because I’m not so sure that I can leave this one alone. What do you reckon? 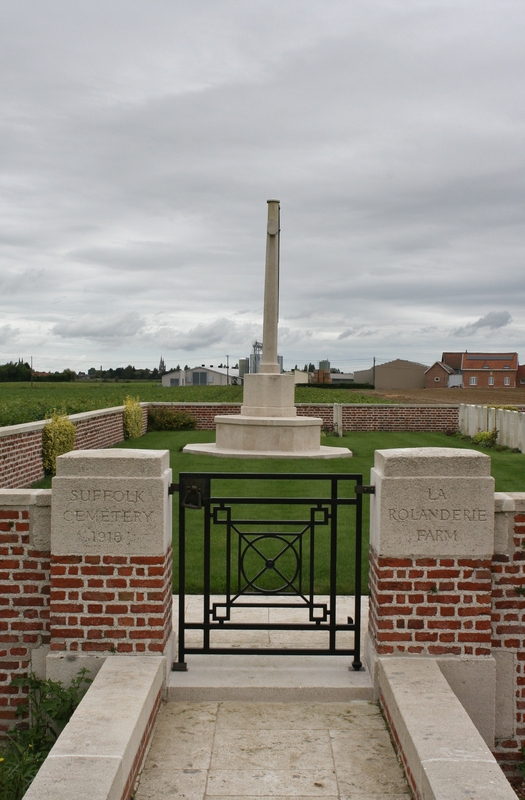 In the meantime, and as a fitting footnote, the cemetery was originally called La Rolanderie Ferme Military Cemetery until 1925, when the name was changed on the request of the late O.C. of 11th Bn. Suffolk Regiment. 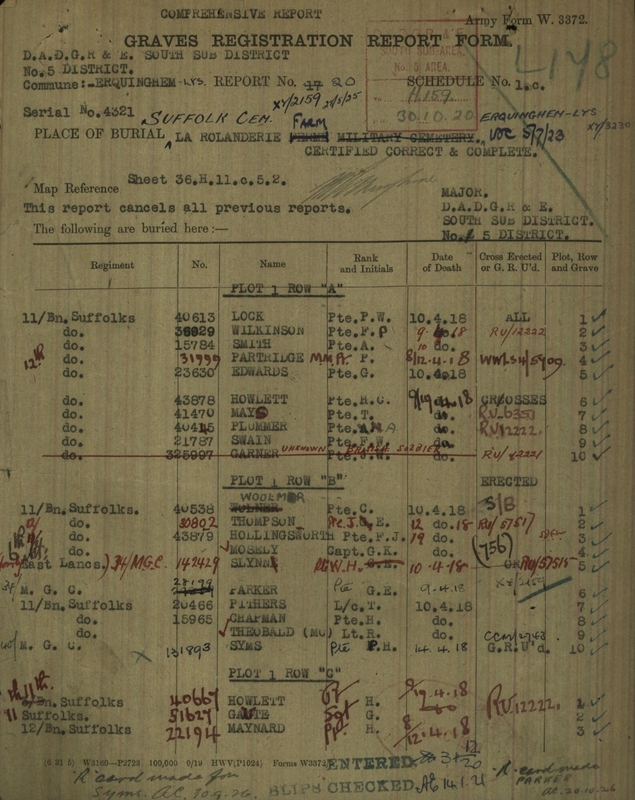 You can actually see, on the Graves Registration Reports, that the new name has been added in pen and dated, on the first form, May 1925 (it is also the reason that we know that the Headstone Inscription form is later than the other two forms, as it bears the new cemetery name at the top). And I gather that Basil Rathbone, who served as an officer with the Liverpool Scottish and gained a Military Cross in 1918, was billeted at La Rolanderie Farm at some point during the war. Finally, did you notice, according to the second of the Graves Registration Reports, that the name of Private Huddleston, whom we have mentioned a couple of times during the post, should be spelt Huddlestone? Of course you did. Nice work there, and I’m sure you’ve arrived at the right answer. I’ve visited this area but missed these two cemeteries. The Suffolk one looks like the type of place I really enjoy visiting, i.e. Off the beaten track, a hidden story of how it came about, not visited often. Its a shame there are no records of the original burials as I assume these would have taken place under fighting conditions or even by the Germans. It’s a wonder so many are known. Also, and I know you’d be the same, how could you make a living out of doing what you do for a job. I’d love to spend my time walking these areas and finding these hidden stories. First of all, MrBob, thanks for backing me on this one – I don’t think I’ve missed anything obvious!! I plan to be in Erquinghem in just a couple of weeks time and hope to discuss all this with someone whom, I believe, has a bit of clout – as far as I know he hasn’t yet seen this post. We shall see. My missus is always talking about making a living doing this stuff. I wish. Any suggestions eagerly awaited. Glad you enjoyed the post, MrB; plenty more coming, I hope. Another amazing “find” and at the end of a dodgy track which I’d rather drive along in a Hummer than walk. Your incredibly detailed research not only reinforces yet again the futility of such wars (especially in this instance the Germans) but also how ferocious this was and so late in the conflict. I felt great empathy and sadness for those men subjected to intense bombardment – thousands of gas and H.E. shells all night long. 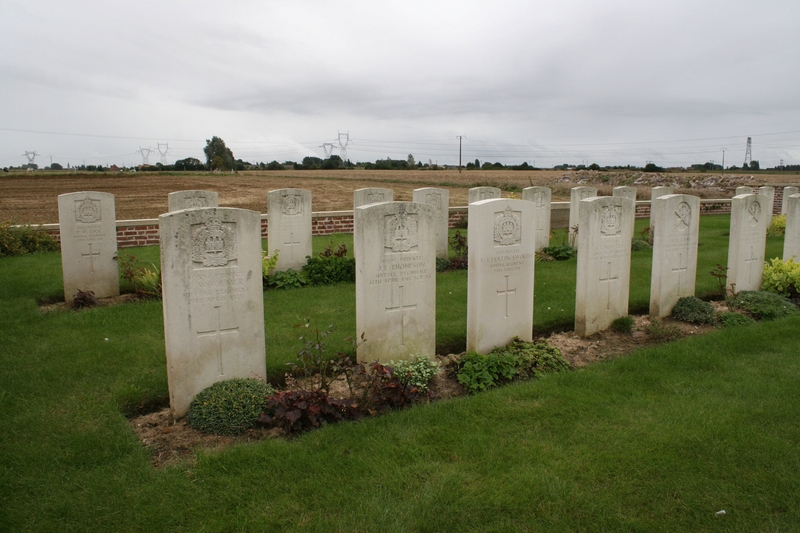 And then twice on the 14th the Suffolks were “very heavily shelled by own artillery causing many casualties.” We just cannot fully envisage the horrors our men went through – those not killed were surely scarred for life. No such thing as Post Traumatic Stress Disorder recognised back then! As to your end question – no do not let it go. Your response to Mr Bob answered the question I was to ask – you are taking up your amazing analysis with someone in authority – let’s hope the record can be corrected. Thank you for such a great presentation – and oh yes – take your missus’ advice mate, you must keep she who must be obeyed happy, write a book to supplement your day job. Well you’d have to reverse that Hummer all the way back – I’m not so sure the farmer would appreciate a muddy turning circle in his field! I knew you’d like this one. We shall see what happens next weekend with regard to taking it further. Thank you so much for this thoughtful article. 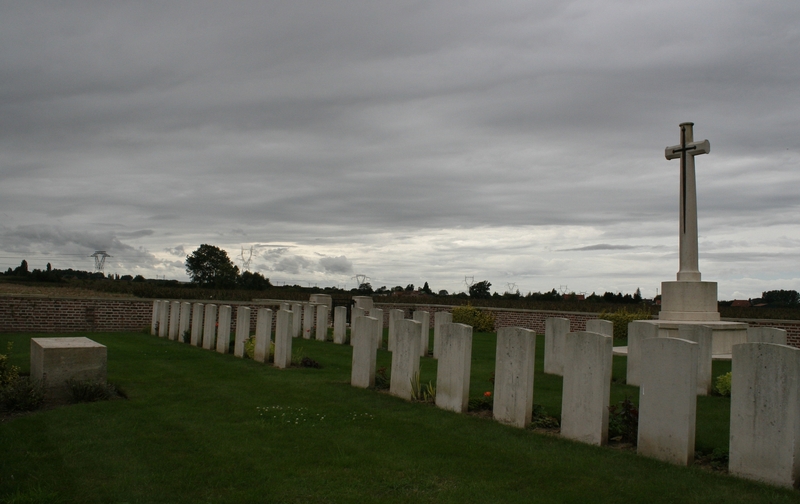 Fred Wilkinson who is buried in this cemetery, was my great Uncle. He had two brothers both of whom emigrated to New Zealand, and there is a big family Wilkinson family in New Zealand as a result. No one ever mentioned Uncle Fred to any of us, but knowing my grandparents, my other great Uncle and my father and Uncle as I did, this omission was all about terrible grief and loss. After my parents died I started to investigate the family through Ancestry.com to build a family tree and immediately found Fred and his brothers. Then, shockingly, I found him in the Suffolk Cemetery. After much searching I found his granddaughter and her family. There are no photos, there is nothing but what remains in a few records, and, the cemetery. Your work is really important because all we have about Fred is a bunch of dates. It’s so important that the dates are right, or as correct as possible. I am writing on what I erroneously thought was the 100th anniversary of his death. Died Between 09/04/1918 and 11/04/1918. Best I could do, because I, like you, believe that the dates are important. The headstones may or may not have been changed yet, but they will be! Thank you so much for commenting here – I will, of course, be visiting Suffolk to take new photos at some point, this year or next, once I know that the work has been done. I visited this cemetery at the weekend, and thought you would like to know that the dates are being changed as the headstones are replaced. I counted at least six that had the date marked as 9th-11th April. If you provide me with your contact details, then I will happily forward the photographs I took of the new stones. Just as a point of interest, and my take on the date complication, I would think it unlikely that any of these soldiers we’re killed later than the ninth. the German attack began here at around 7am on the morning of the tenth, and the troops were in full retreat by 7.30pm the same day. unless they we’re retrieving bodies and burying them during the firefight, the body of anyone killed on the tenth would have very likely remained where it fell. And given that we didn’t retake the area for 5 months, I very much doubt there would have been anything identifiable left to bury. Funnily enough, I recently reported to the CWGC that the date of death for Sapper 1057 Eugene Kelly, given as the 11th April 1917 was also wrong. He was with a small detachment from the 3rd Australian Tunnelling company and was killed on the outskirts of the village during the retreat over the Lys. He has no known grave and is commemorated on the Villers-Bretonneux memorial. 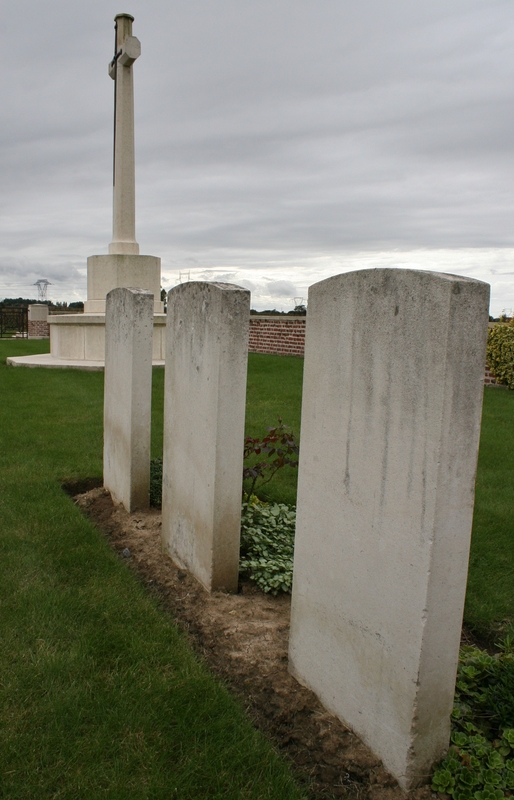 Again, I pleased to say that the CWGC are amending their records accordingly. Nick. Apologies for a slightly late reply but I have a good excuse – four days in Flanders and then Peronne with 50 or so ex-servicemen, from Generals to NCOs. Only got back last night. Thank you very much indeed for letting me know – my spy in the Erquinghem area clearly isn’t earning his money. I would very much like to see the photos you took – of course I would! As you have made a comment, and with the new DPA legislation, as I have your email address, if you will allow me to mail you then you will have my address to reply to. Is that okay? You know exactly my thoughts on the actual dates from my post – but 9th-11th is one hell of a lot better than before, I think we agree? And definitely includes the correct date. Good stuff about Sapper Kelly, btw. I have another man that I have been investigating for six months now whose date of death is wrong also, but this is proving far far more difficult despite the evidence, for reasons I would be happy to discuss off-post if you are interested. Oh, and your final comment made my day. Thanks ever so. I must also apologise for the somewhat tardy reply. I’ve only just realised that notification of your reply had gone through to my junk mail (I think you had the better excuse tbh). I would be very please to hear from you directly, and will happily send copies of the photos I took by return email. I would also be very interested to hear about the chap you are looking into, and will of course do anything I can to assist. Hey Nick. Anyone who freely uses the wors ‘tardy’ is all right by me. Anyway, I’m glad you checked your junk. Will be in touch. Have mailed you – you might wish to check your junk mail again, just in case. Hello. I am an Australian living in Indonesia & had a great uncle in the Australian 14th Battalion. The 14th was handpicked to perform the first trench raid for the 4th Australian Division & only the toughest of the tough were selected, my great uncle being one of the 80 men. 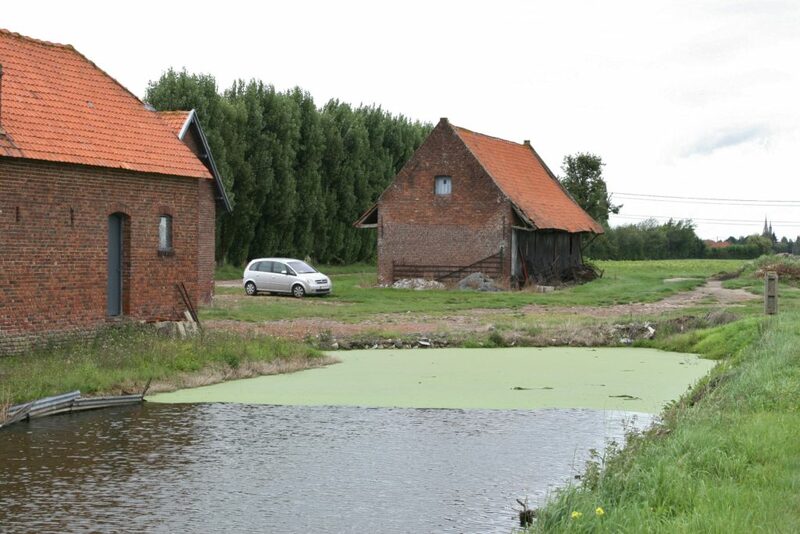 I am researching this raid & came across La Rolanderie Farm as the place where 2 weeks of training occurred before their raid on 2-3 July 1916. Unfortunately the wire in front of the German positions was not cut by the artillery & trench mortars & the delay in traversing the wire caused a lack of time in the trenches & casualties on the way across & back…estimates said over 50 Germans were killed, mostly in dugouts but the raiders failed to bring back a prisoner or any loot. While trying to discover where La Rolanderie Farm was I came across your post & was very interested although Australian Military History is my passion… I enjoyed the stories & love your work. Thank you very much. Daisy in Bandung. Thank you Magicfingers… have now been on the Fromelles link & found more information I was not aware of. Much appreciated from an Australian point of view. Bandung was occupied by the Japanese in late February 1942 & some 4 million Javanese died before the Japanese surrender of 1945. A very famous Australian Sir Edward Weary Dunlop was captured here & sent on the Thai-Burma Railway… another horrific story. I spent ANZAC Day this year at the CWGC cemetery in the heart of Jakarta, a city designed for 800,000 people but now home to over 10 million. The CWGC cemetery is an oasis of green in a concrete jungle. There are some very interesting burials there… Thanks again… Daisy in Bandung. Hi Daisy. 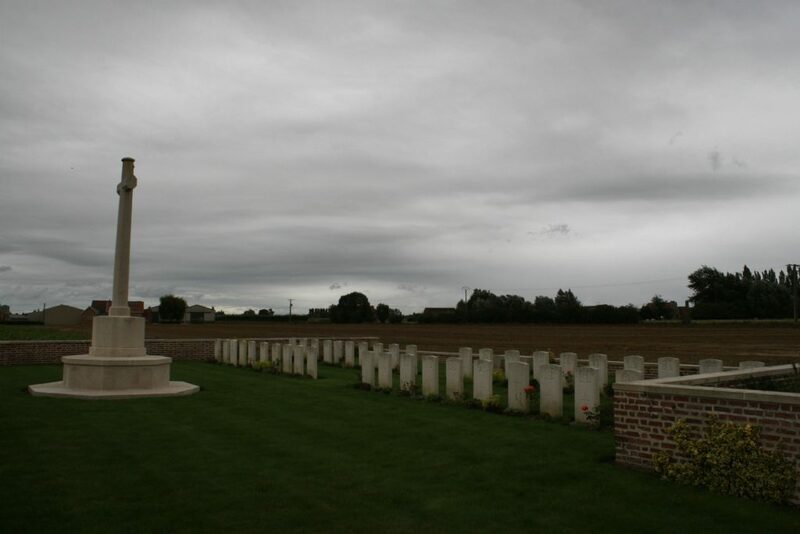 The link I sent you is the first of ten that cover the Australian tragedy at Fromelles: if you go to the Categories section on the right of the page and click on the ‘Fromelles’ link it will bring up a list of the rest of the Fromelles posts (which include the Australian Memorial Park, V.C. Corner and of course the new cemetery at Pheasant Wood). I haven’t yet put in links at the end of each post to get you to the next one – I will do so soon – so you’ll need to click the Fromelles category after each post to get back to the Fromelles posts ‘list’. Does that make sense? 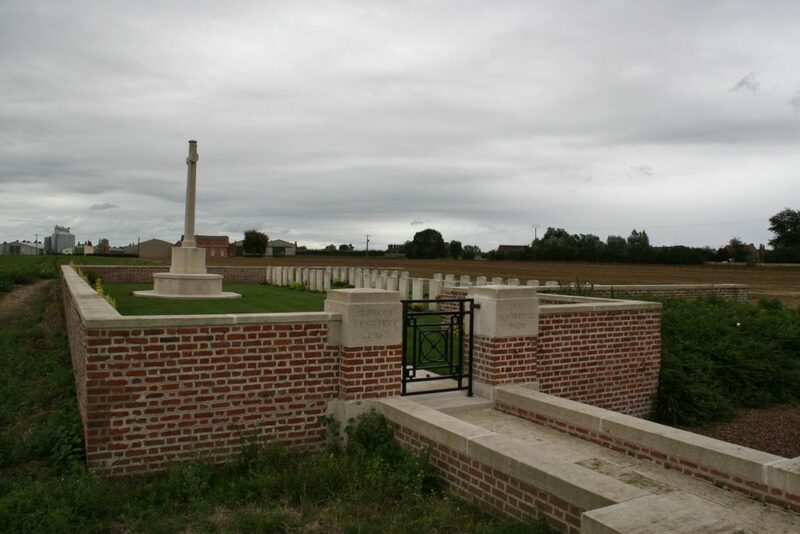 There’s a huge amount of stuff about the Australians across all the Fromelles posts, but particularly as we get nearer to the village of Fromelles itself. Lmk if you have any problems finding these posts. I have heard of Weary Dunlop, and of course am well aware of the horrors of the railway. Interestingly, my history teacher at school was one of Wingate’s Chindits who spent much of the war behind Japanese lines in Burma. And having looked up Jakarta War Cemetery, I see what you mean about an oasis of green! Hello Magicfingers, I have just found an old photo album of my recently departed aunt which has some photos from 1897 & possibly later of an obscure relative in military uniform which appear to be British. Can I send them to see if you can identify the regiment? Hello Daisy….unless I’m horribly offending Darryl. I am no expert in such things, but I know some people who are. I’d like to see the photos anyway!! I will need to email you so that you have my address. Is that okay? Hello Magicfingers, Yes, happy for you to email me… appreciate your assistance, Regards, Daisy. Hi, firstly thank you for such in depth research, I have recently started looking into my family history having taken a DNA test predominately to find out information on my grandfather on my fathers side who was adopted, and while I have made some progress on this it came to light in discussion with my mother on her family that I found out my great uncle Pryce Robert Jones, who was in the 11th Battalion Suffolks and died 19.04.18. I initially found this a little strange that a south london lad would be in a suffolk regiment but I guess they went where they were sent. He joined with his friend who returned home and the story he told was they were both captured and that he was taken one way and Pryce another and was never seen again. I know from the CWGC website that he has his name on panel 3 of the Ploegsteert Memorial. Which i will be visiting this November for the 100 years memorial services. Ironically the reason I decided to visit was due to the brass poppy I bought for last years remembrance which was dedicated to a Pvt J Beamont Coldstream Guards who fell at Passchendaele 11/10/17. 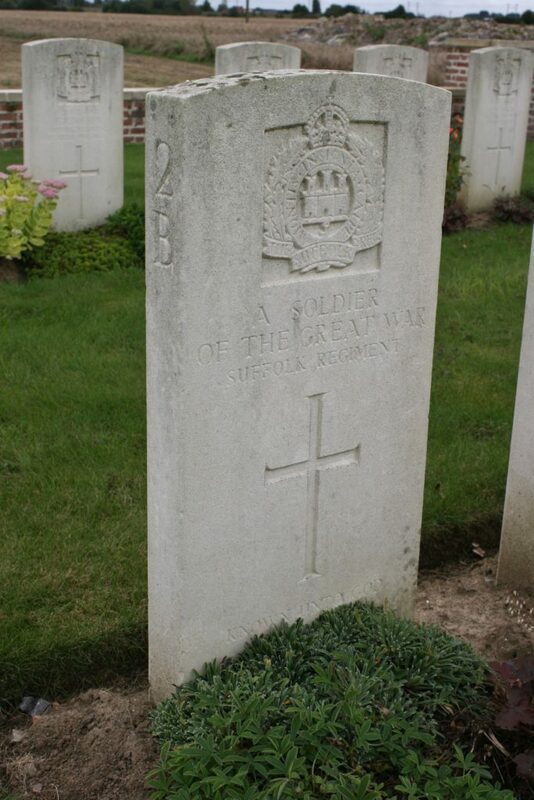 I decided that I would visit his grave this November at this point I had never even heard of my Great Uncle so with 4 friends we booked to stay near Huevelland, which is roughly 4 mile from Ploegsteert. Please feel free to email me I would like to find out more about the regiment and men if possible. I have downloaded the war dairies but for this timescale it only gives general battle reports and not anything about the men themselves. A quick response Mark, as I have just returned from the Belgian Grand Prix and am knackered! Thanks so much for commenting and I will indeed email you in due course. Give me a couple of days. Mark, I mailed you a few days back. Check your spam? Daisy, I have emailed you just now. Check your Spam if you don’t receive it.